Drum Machine.JPG, originally uploaded by jrambow. I thought this was really cool. 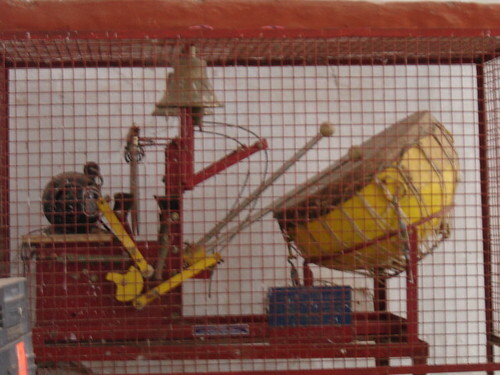 It's a drum and bell machine I saw at Bangalore's Bull Temple. You can see the motor to the left and how it's connected to the drumsticks. It wasn't going, unfortunately -- would be fun to see it at work, and to see how you adjust the speed of the drums and bells. As you can see, the machine was in a cage to prevent curious people (and monkeys!) from getting a rhythm going at the wrong times. If some hipster band in Brooklyn or Berlin or Rio knows what's good for them, they'll try to get their hands on one of these ASAP and use it on their next album. Maybe someone already has . . .
Yeah, very cool pic, but I wonder how it sounds. LOL! I live very close to the temple and I've beem seeing these contraptions for ages! LOL! Quite amusing to see them on Boing Boing! I work for a radio station here! What do you guys do? And Are you still in Bangalore? Anyone got a video of one of these?